It’s been a busy past two weeks. A week ago last Wednesday, we were awoken at 7:30 a.m. by the driver of our moving truck saying, “We’re here.” It turns out they were here with our stuff and were here a day early. So, Jennifer and I, threw on some clothes and headed over to our new rent house to let the movers in. The past week and a half has been pretty hectic as we slowly get all the boxes unpacked. We still have a garage scattered with boxes, but the house is mostly unpacked. This house is slightly smaller square footage wise, but you can tell it doesn’t have as much storage as our last house. The biggest hit area is the kitchen, which is much smaller. What happens is those kitchen gadgets, like the ice cream maker that you’ve only used a handful of times…they have no home. So either, they get tossed or they find their way to a box as a future garage sale item. 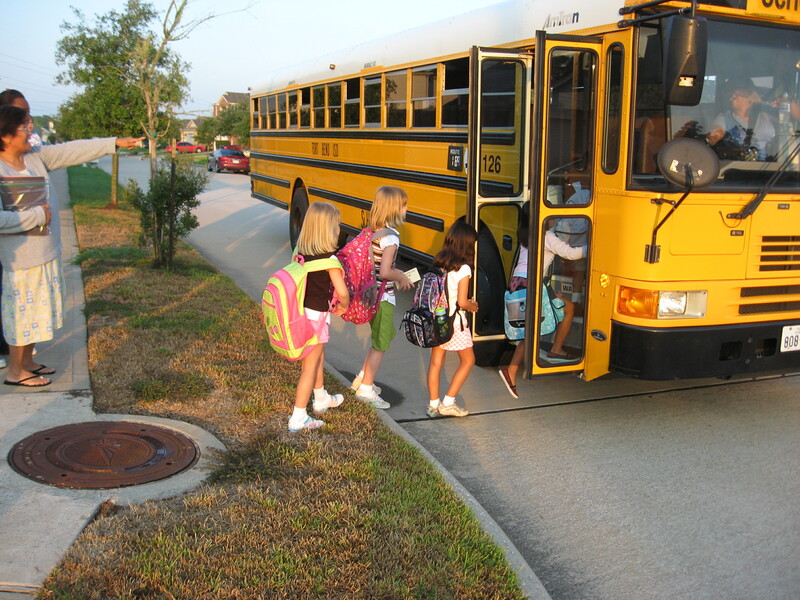 With all of the moving, the first day of school arrived quickly. Today Abby, and for the first time, Emily, got up early and got ready for school. We met their teachers and got to go up and visit their classrooms last week, but today was the day all parents look forward to. They both found their classes fine and had a good day at school. Emily was amazed that you didn’t have to bring your lunch if you didn’t want to. That you could get lunch at school. This was a foreign concept for her. They both made their way home on the bus safe and sound. Izzy had a quiet day playing by herself upstairs and watching many episodes of the Mickey Mouse Clubhouse. The end of this week was really busy as we left the girls with Jennifer’s parents and Jennifer and I flew back to Orlando in order to get the house packed up. We arrived on Wednesday night at 1:00 a.m. to find out that the air conditioner was out. I reset the system and we waited until 2:00 a.m. to see if it would cool down, but it didn’t, so we just turned our fan on high and toughed it out. First thing in the morning we called the air conditioning people just to find out that we needed a new compressor. Great. Just something else that I had to fix on the house I no longer live in. On Thursday afternoon, some people from the movers arrived in order to pack our house. We helped, but it didn’t take long before our house was full of boxes. 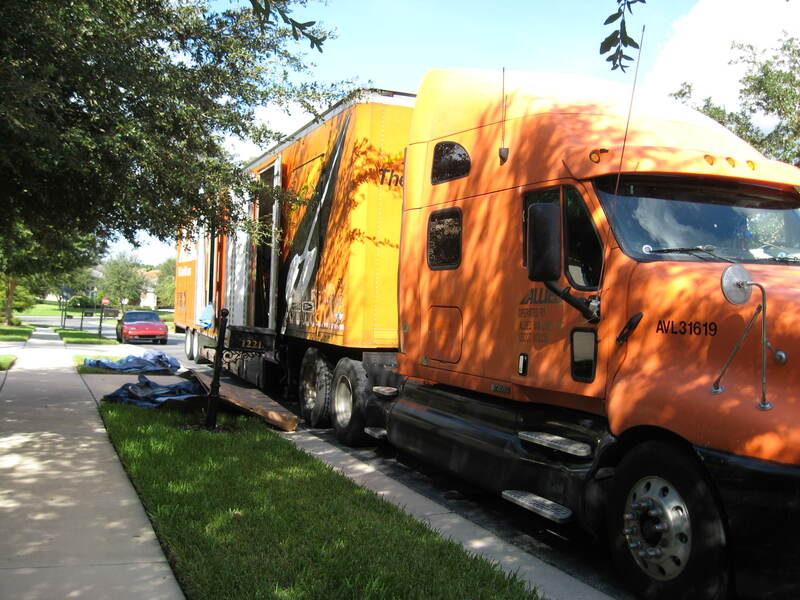 Then on Friday morning, the big orange truck pulled up to the house. It took about five hours, but everything was put on the truck and we were left with an empty house. We cleaned as much as we could and painted a few walls that got nicked by the movers and then we were off to a hotel to clean ourselves up and collapse after a long and stressful day. This weekend we took the chance to see if Sienna Plantation would allow us to go ahead and give us passes to the pool. Our lease doesn’t start until August 14th, so right now is the calm before the storm. Without much to do since the next two weekends will be busy with moving plans, we decided it was time to give the pool a whirl. So, they didn’t care that it was still two weeks away until we take possession of the house and they went ahead and let us in. The pool has a huge kids area with slides and a giant bucket which fills with water and then dumps down onto the kids below. Emily loved this area and spent most of the time diving under the water and holding her breath. We kept getting worried that the water from the giant bucket was going to drown Izzy, and we always looked up every time she got close to where the water sprays down. They also had other water slides just the right size for Abby. Looks like we are going to have some fun weekends down at the pool once we move in.